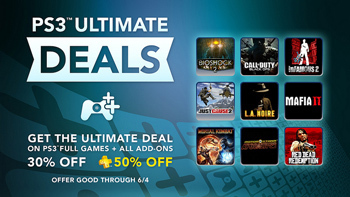 "Ultimate" versions of nine popular games went on sale on PSN today. All of the games in the promotion come bundled with their various DLC packs. The games are discounted by 30% for regular Joes and 50% for those of you who sprung for PlayStation Plus. Sounds impressive, right? Well, unfortunately, those discounts are taken from the titles' mildly inflated PSN prices, so while there's a couple of good deals in here, there's no need to trample your children in a mad dash for your credit card. The offer is good till June 4th.